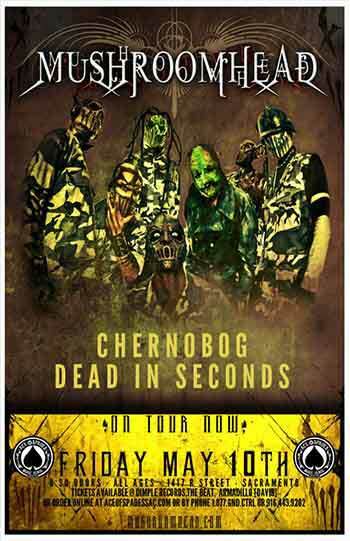 Chernobog ~ "Chamber of Lies"
MUSHROOMHEAD with Chernobog, Dead In Seconds, Ionia, Lydia Can't Breathe, Final Trigger at the Ace of Spades in Sacramento, CA on May 10, 2013. 4.19. PEABODYS - CLEVELAND, OH. 4.20. MCGUFFYS - DAYTON, OH. 4.21. CASTLE THEATRE - BLOOMINGTON, IL. 4.22. BUSTERS - LEXINGTON, KY.
4.23. LOST HORIZON - SYRACUSE, NY. 4.24. ALTAR BAR - PITTSBURGH, PA.
4.25. DIAMOND PUB - LOUISVILLE, KY.
4.26. MACHINE SHOP - FLINT, MI. 4.27. ALROSA VILLA - COLUMBUS, OH. 4.28. MOJOES - JOLIET, IL. 4.29. CENTER STAGE - KOKOMO, IN. 4.30. PLANET ROCK - BATTLE CREEK, MI. 5.01. CLUB FEVER - SOUTH BEND, IN. 5.02. BAR 3 - ROCKFORD, IL. 5.03. AFTERSHOCK - MERRIAM, KS. 5.05. TOP DECK - FARMINGTON, NM. 5.06. MARQUEE THEATRE - TEMPE, AZ. 5.08. THE WHISKEY - WEST HOLLYWOOD, CA. 5.09. FAT CAT - MODESTO, CA. 5.10. ACE OF SPADES - SACRAMENTO, CA. 5.11. BUNKHOUSE - LAS VEGAS, NV. 5.12. KAMIKAZES - OGDEN, UT. 5.13. BLACKSHEEP - COLORADO SPRINGS, CO.
5.14. SUMMIT MUSIC HALL - DENVER, CO.
5.15. BOURBON THEATRE - LINCOLN, NE.